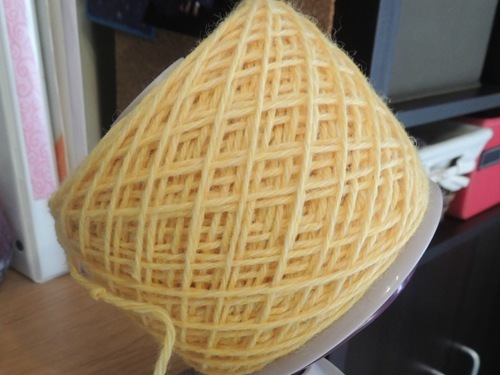 Did you know that you can’t knit from a hank of yarn? When I was a beginning knitter, I bought yarn that was in hanks from a local yarn store and no one offered to wind the yarn for me. 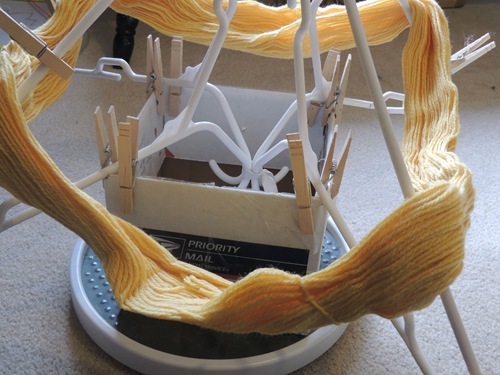 I didn’t realize that I couldn’t knit straight from the hank – and I wondered why I kept having a tangled mess. No idea what I’m talking about? How do you get from one to the other? Well there are a variety of tricks out there, some involving using the back of a chair or someone else’s arms. I used to drape the skein around my neck like a huge necklace and unwind it into a ball. But the easiest way is to use a ball winder and a swift. 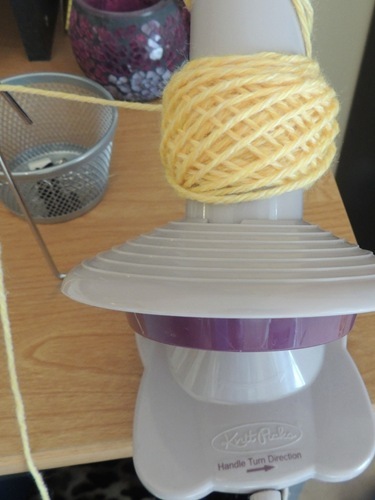 I bought my ball winder from knitpicks.com, but although their swifts are less expensive than the many fancy kinds you can buy, they are still pretty expensive at $65. So I made my own. And though it’s not perfect, it is much better than winding yarn with my body. I believe the original version of this is here. If you want clearer directions, you should go there. Here is mine at work! 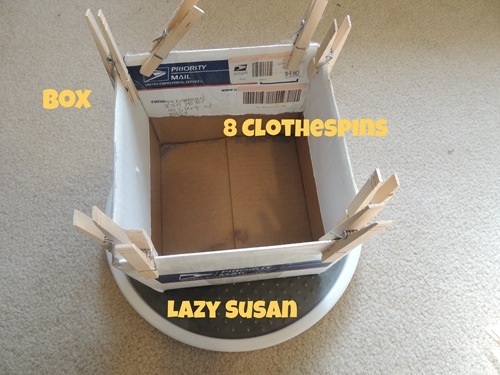 Fold down or cut off the tops of the box. Stick clothespins onto each corner. Place on Lazy Susan. 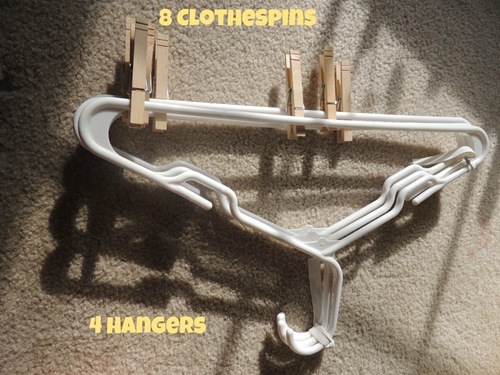 You will spread out your hangers, putting their hook sides into the box and propping them between the clothespins that are on the box corners. 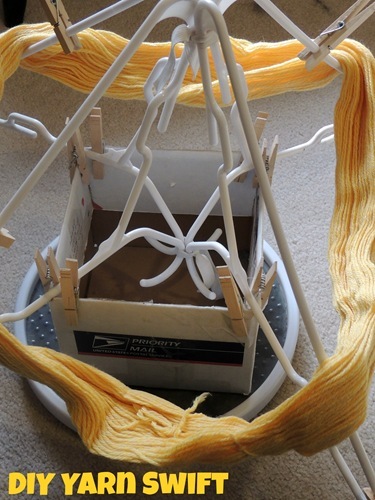 The yarn is placed on the hangers as shown, lying in between the clothespins. 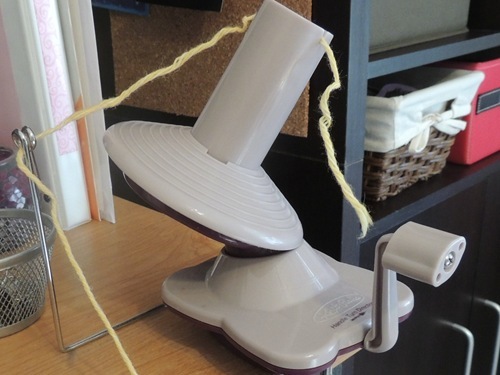 This keeps the yarn from flying off the hangers while you are winding. I have to watch my yarn as it spins to make sure it doesn’t come off of the hangers, but I have found this solution worthwhile! The best part is that I take the hangers off, stick them into the box, and put the whole thing in my linen closet until the next time I need it. 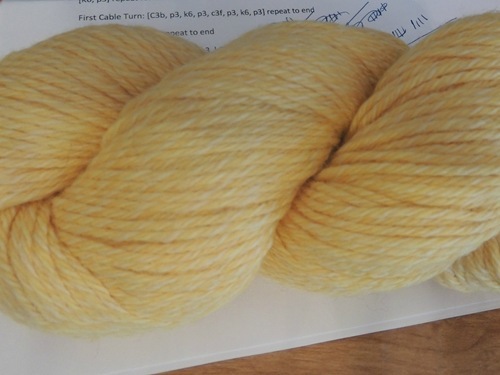 Wondering what the lovely yellow yarn is for? Click over to Leslie’s site where you can see the Rapunzel hat I made for Violet, plus enter to win one!